Our round-up of the gigs we went to in December 2014. The Shed. Goldstein played punk with plenty of rhythm. The Bowbridge Band were without a drummer tonight so their two guitarist/singers did an acoustic set. Casino Empire have stood out this year playing almost every month throughout the year on one stage or another. It was good to see them back at The Shed tonight. As a band they are five individual characters but they all work together exceedingly well. Some young bands look like something out of Attack of the Clones but this is one that does not. 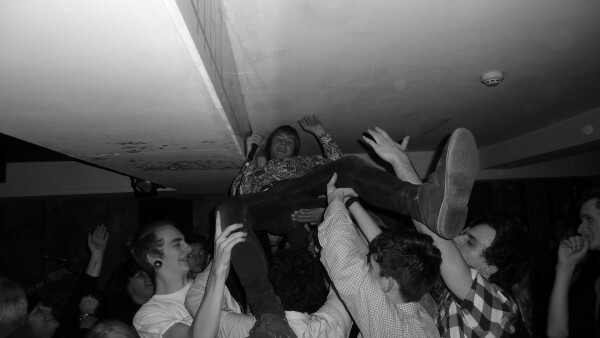 Lead singer Tommy Cobley seems to be the one rock star of Leicester that everyone remembers. Lois from Nottingham had three good singers at the front and brought forth many favourable from members of the audience. “Say they are a happy-go-lucky band” one person said to me and I think that was a good comment. They played plenty of punchy rhythms and their guitar work was amazingly good. It was music to dance to. The evening closed with a performance by Doc Savage. A four-piece band with a lead singer nand singing drummer. Engaging songs. The Soundhouse. The open-mic Christmas party hosted by Rhett Barrow. Many exceptionally good singers and groups on stage and also a magician Colin Skinner. Numerous acts but Initial Thought and Suicide B’s stood out for me. 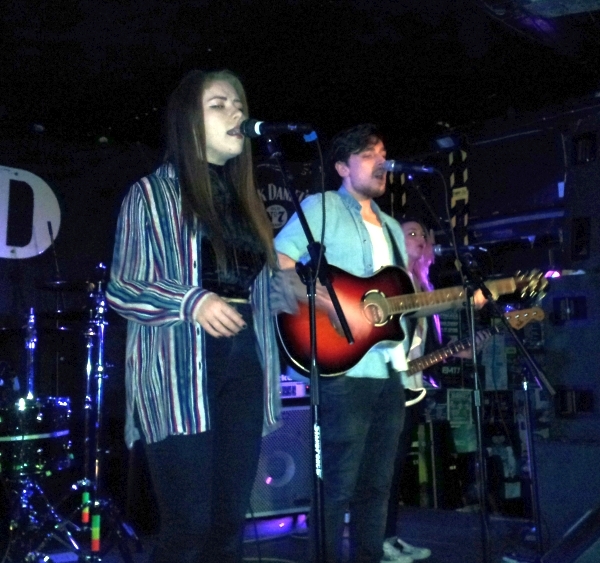 City Link-Up brought a talented line-up of young artists to the stage at The Cookie Jar; this afternoon’s show was a celebration of youthful musical talent from all over the Midlands. 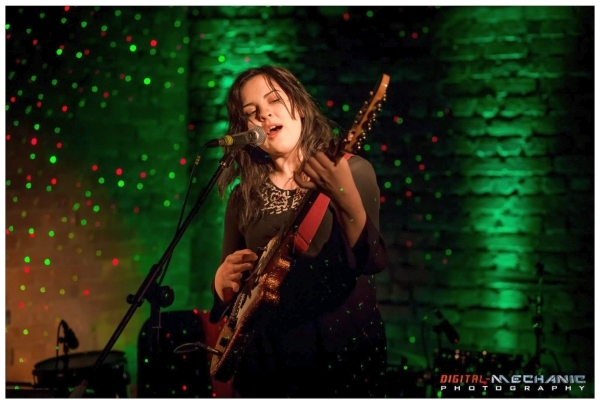 Leicester band Resin held their Christmas show at The Firebug. With support from Leicester’s Temple of Lies, Martyr de Mona from Stourbridge and Slam Cartel from London, the headline slot went to Resin. It was a night to remember. See our review of this gig. See photos from this show. The Y Theatre was the setting for the release of Midnight Wire’s Crossing the Rubicon album launch. Support from Casino Empire and Stop That Train gave a great lead-up to the headline set of Midnight Wire. Read our review – up now. Charity night for Rainbows at The Shed with Castle Hill, Velocity, Stating The Obvious and The World Can Wait. An unusual feature of the line-up was that Velocity played twice. They played so well that everyone wanted to hear them again. Read our full review of the night. 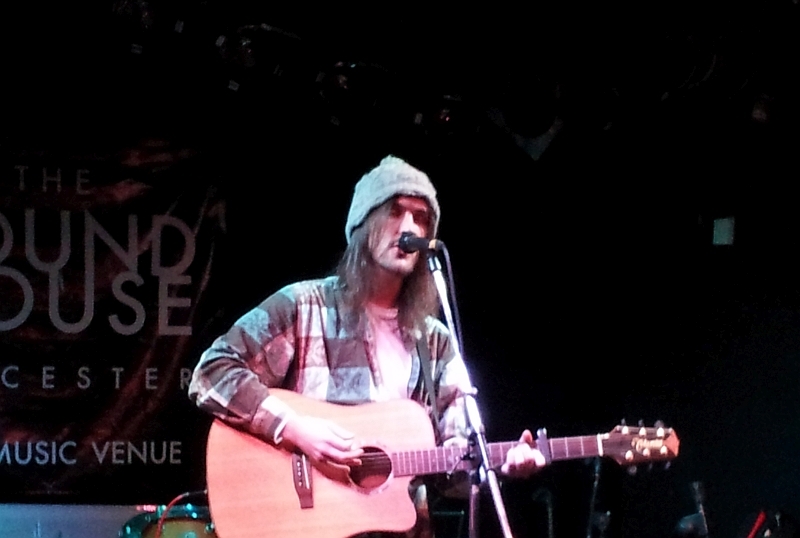 A brilliant night of music at The Soundhouse. 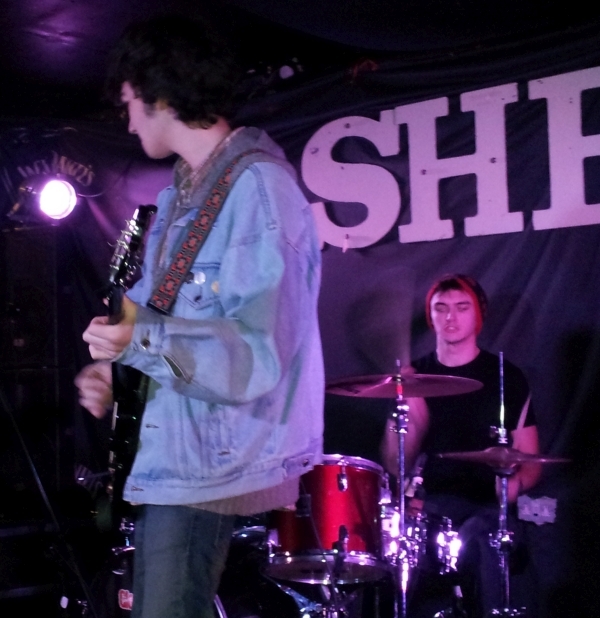 Scribble Victory – two guys on guitar and drums – delivered beautifully harmonised vocals and a set of energetic songs. 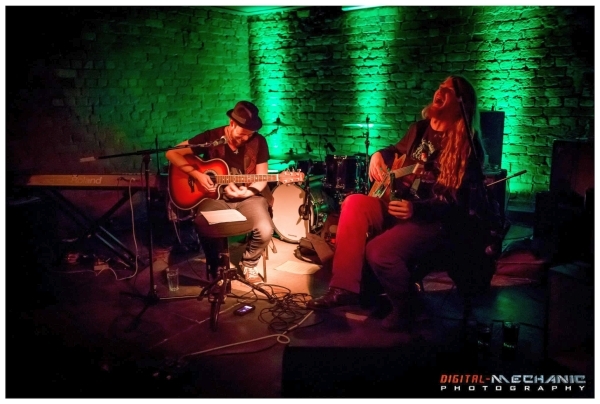 A performance full of vibrancy and musical quality, their unusual act was very likeable. All round good night of music from top artists. Read more about 8Miles High when they played with The Bobcats at The Musician on 8th December 2013. Read our feature article on 8 Miles High band. 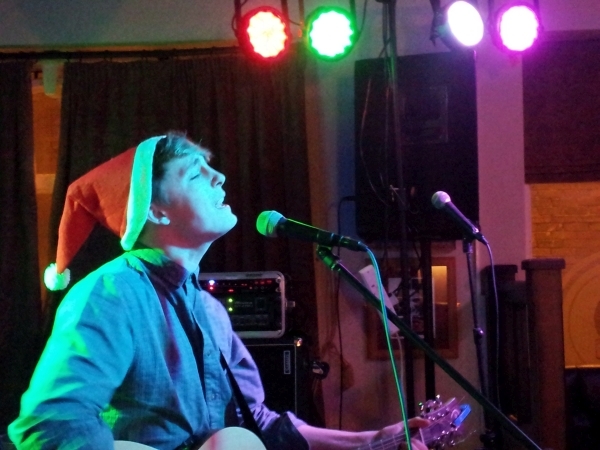 The Barley Mow for the Glastonbudget Christmas party, with Aaron Stratton and Big Bad band. The Shed. Jonezy did a surprise performance. The Cookie Jar. Casino Empire did their single launch. Keith Jobey was there. 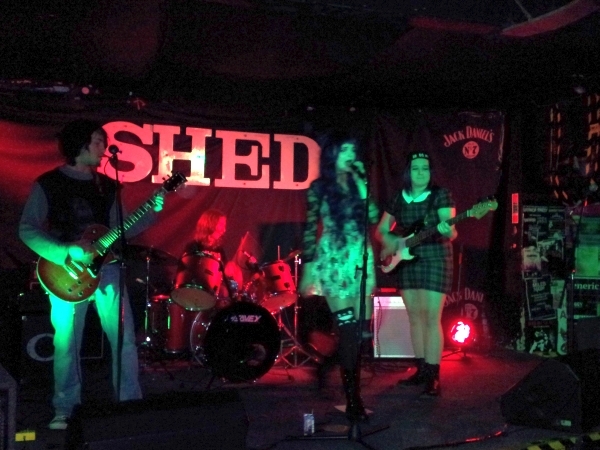 The Shed. 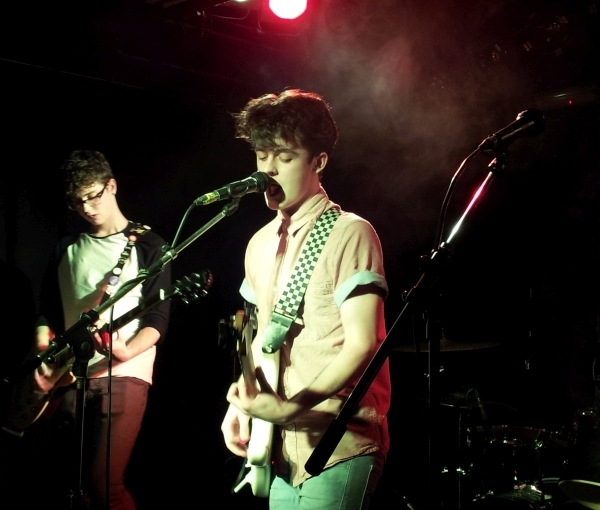 The last showcase gig for Leicester’s young bands. 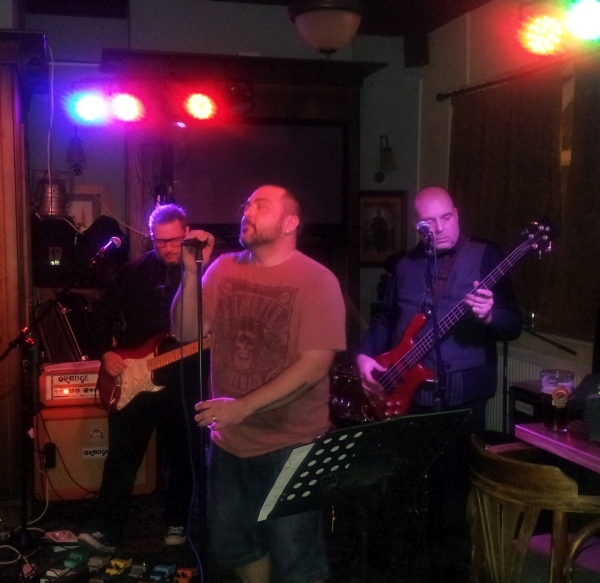 Before The Crash launched the night with a rousing song led by singer Shezza Wileman. Mid City (previously known as Murmur) delivered a sizzlingly good set. Flight 15 put on a sensational set. The night was headlined by Midnight Wire, playing a special guest appearance ahead of their big album launch gig at The Y Theatre on Friday. See our feature article on Midnight Wire. A cold wet Tuesday evening and The Shed was not exactly heaving with people. 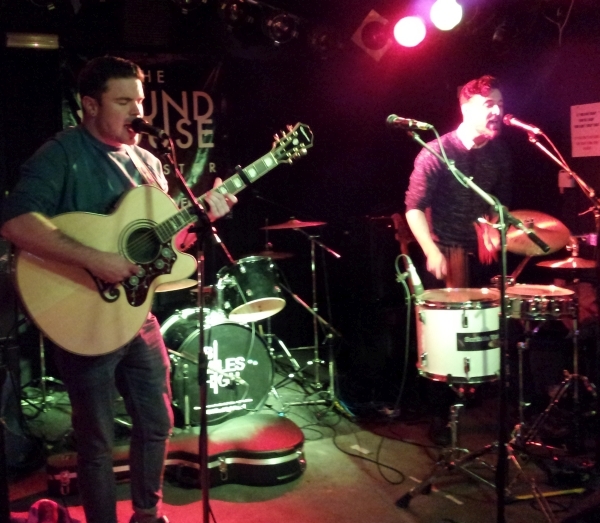 The Leicester three-piece band put on a set og strongly ear-grabbing songs. 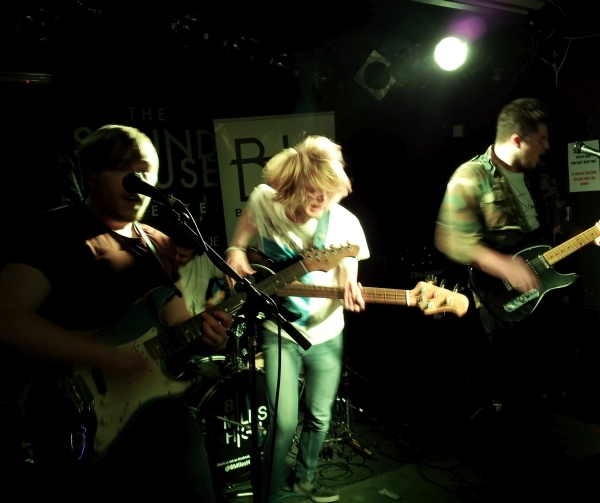 The Greys had plenty of energy and attack which they laced with some sparkling guitar solos. They played their own version of The Arctic Monkey’s I Bet You Look Good On The Dancefloor, a favourite cover of young bands. As student bands go, they are not at all bad. Strong drumming and solidly good singing from the band’s vocalist Declan Robertson they showed that they have their fingers on the pulse of what makes exciting music. 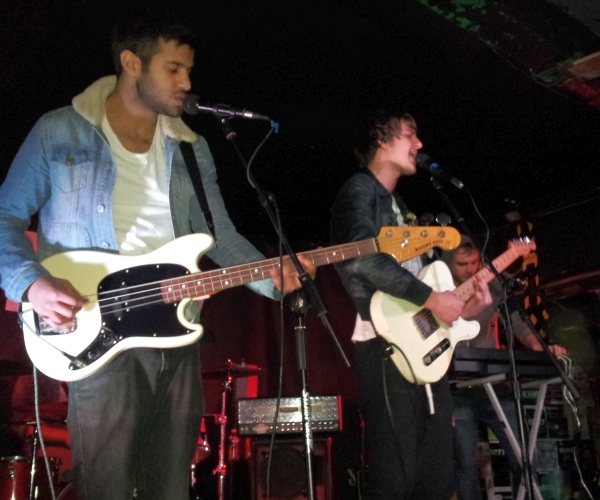 The Greys played some of their own songs and finished with a mash-up of some well-known rock classics. 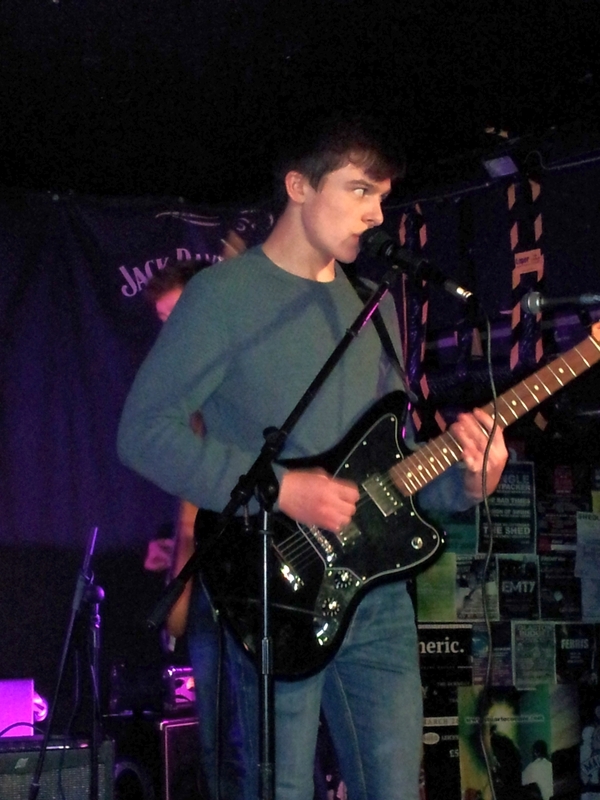 Sam Taylor played his first gig at the start of the show. He delivered an animated performance with well-articulated singing. A busy night for live music in Leicester with shows at The Cookie Jar, The Musician, The Shed and The Soundhouse. It may be cold outside, but inside the Cookie it’s as warm as the welcome and now there are winter warmers on the drinks menu. In case you need to be even warmer. Courtney Askey only found out she was playing this gig a few hours prior to performing. The original support, To Abolish (previously called Numbers On The Board) pulled out late on the day. 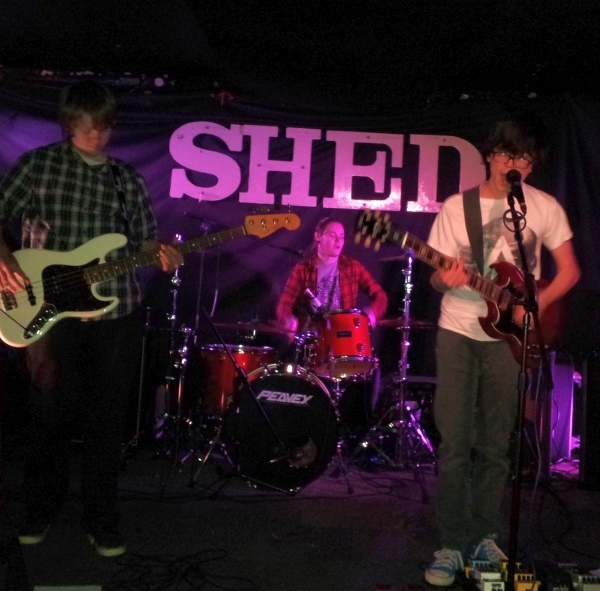 Which was a shame because I enjoyed them at the Shed during Oxjam this year. At least Courtney is a worthy replacement. With her sparkling guitar set off by the twinkling, swirling lights, she opens with Back To The City, a great song that epitomises her style. That’s three times I’ve caught her live in as many months and I’ll happily catch her again. 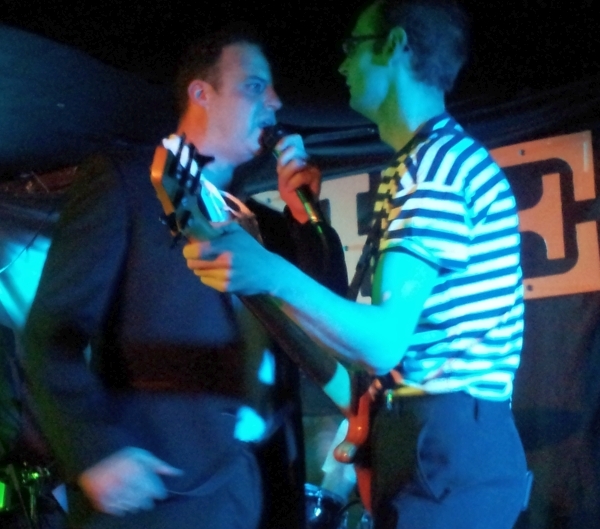 Acid Haystack and the Shattered Villain (Andrew Mills and Daniel Heath) are another act I caught at Oxjam. They play a kind of acoustic Dropkick Murphys style, a gypsy/folk/punk vibe. Declaring that the theme of their set was drinking and killing they performed with a great deal of humour. The humour overflowed during the final song as they asked Rich on sound to ‘fiddle’ with some knobs on the mixing desk to add lots of effects, a task he performed masterfully, bringing about laughter from both the audience and the band. 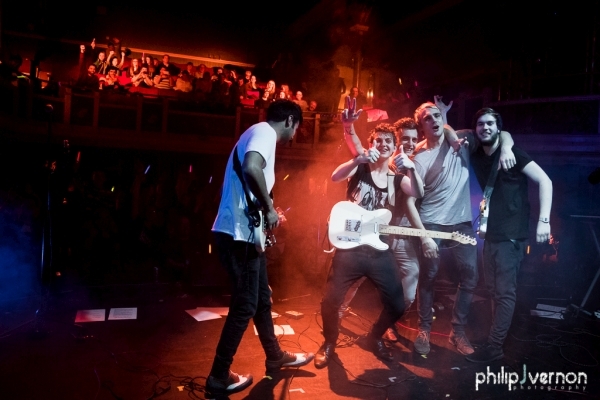 It went down so well they decided to play an encore! I know this is a nice thing to do but what it meant was some of us lost out on some of the headliners set as we had to leave for last busses. 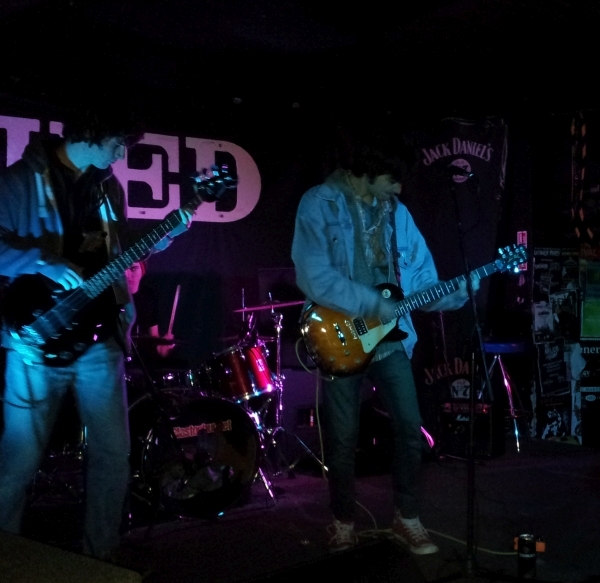 Echolocation were playing with a full line up, that’s 8, so it was a fairly busy stage and a really full sound. With tight playing, great sound and an array of instruments the music they make is fantastic. 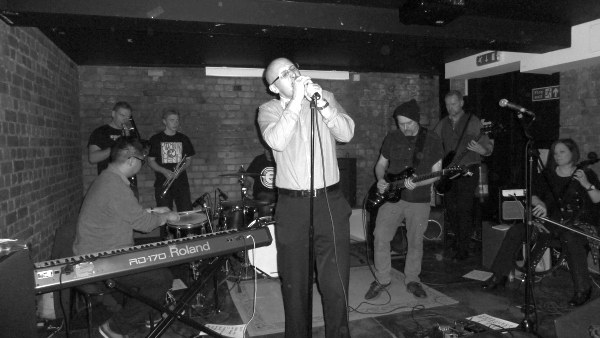 Peter Ingram’s spoken Fallesque vocals adding another element that helps make this band stand out as one of Leicester’s most original. With several years as a band under their belt they have a decent back catalogue of songs to call upon and these gigs they put on showcase some super bands for the price of a cheap pint. Finally, it was good to see Andy Askey in the Echolocation line up after his recent stroke. This night giving him a target to drive towards on the road to recovery. We wish him the best of health in the future. A great line up of artists supported this charity fund-raiser for the PDSA. Singer Aaron Stratton gave a fine performance; he is an artist we have followed since he started. Tonight the 18 year old singer put on a very good performance. The Elastic Band put on a superb set, featuring the work of Mike Sole on Keyboards. Multimorph were there with their light-show projection generated from water and drops of coloured oil. At The Glastonbudget auditions it was good to see Leicester’s We The Brave. 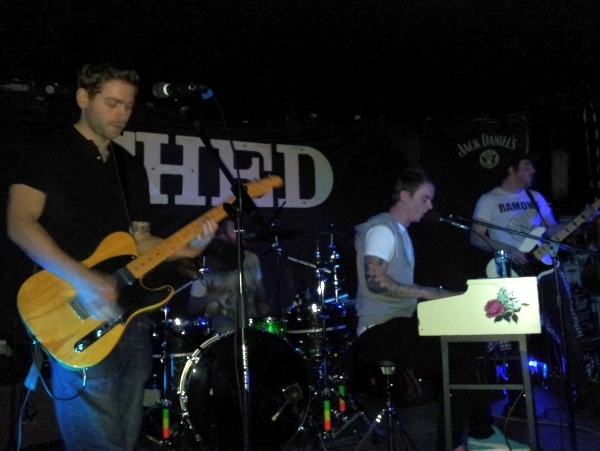 Members of this band were Adam Gent – Vocals/Piano, Aaron Murray – Guitar, Andy Winfield – Drums, Martyn Preston – Bass. I have known Adam Gent since he was the drummer in ICTUS, and Aaron Murray, the then lead singer of the band, back in the early OOs. We Are The Brave did a hugely good set, with sensational singing from Adam and strong backing vocals from other members of the band. They were phenomenal. So good to see these guys making music again. 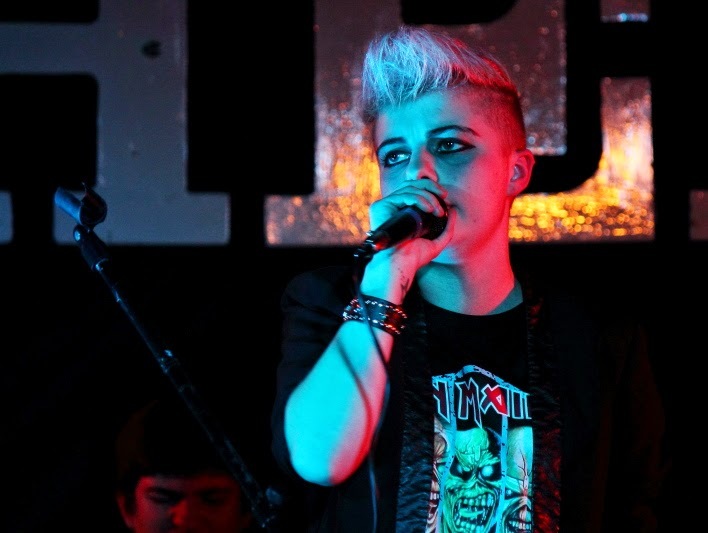 We also saw Bella Diem, from Birmingham and very much liked the vocals from Lucy Dines and other band members. A good performance that drew much favourable comment from many people in the room. was supposed to be one of the venues on tonight’s itinerary but sadly it was not possible. A great shame because it would have been good to see The World Can Wait once more. 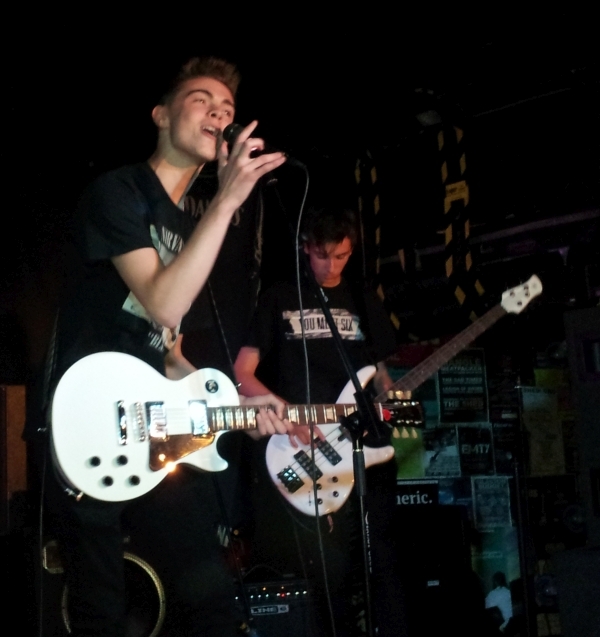 This is a band we rate highly for their engaging music and the fine vocals of lead singer Sully Archer. At Curve, we went to see The Sound of Music, Rodger’s and Hammerstein’s classic musical. It was a fine production and the singers and the band were high quality. A great show. Read our review of The Sound Of Music on Arts in Leicester. 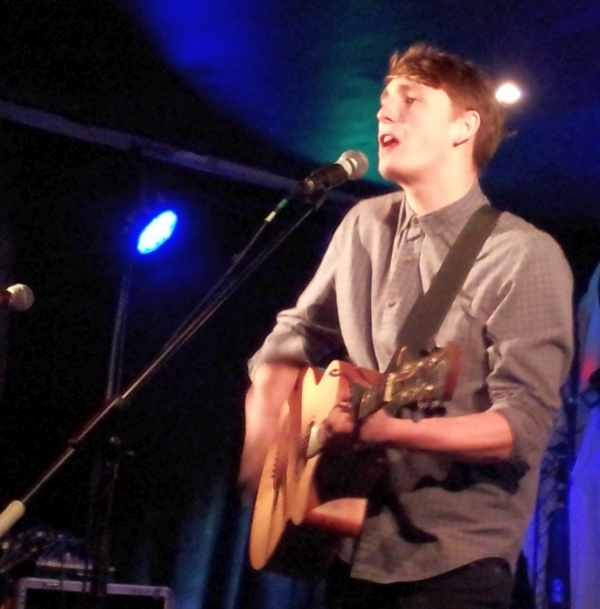 At Rhett Barrow’s Open Mic night, Matt Henshaw gave a superb performance. Fine singing from this increasingly well-known Leicester artist. 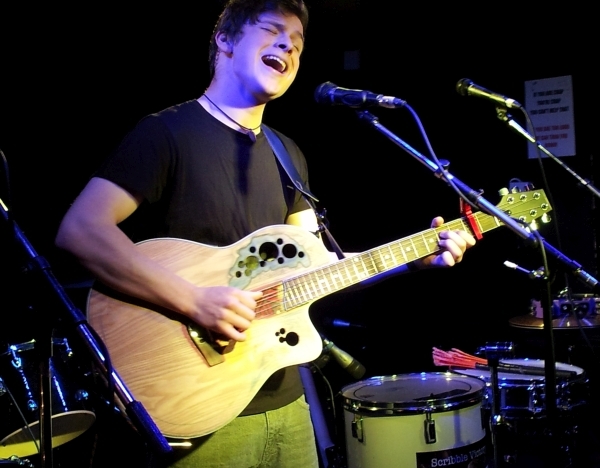 Matt has been in tour recently, experiencing what live music is like outside of Leicester. It will be interesting to see what Matt has to say about this. Also on stage tonight was Leicester beat-boxer Steve Shuter, whose technical abilities are amazing. We saw him when he played at Carol Stein’s alternative music show at the Musician. Joe Scott was another of the acts we saw tonight. We are all looking forward to the Open-Mic Christmas party at the Soundhouse on 23rd December. It’s always been a good event and a highlight of music at Christmas.